Romeo y Julieta Mini is a mild-to-medium flavored cigarillo, of 19 ring gauge, 3.22″ (82mm) long and comes in 5 packs of 20 cigars. • Delicious tobacco from Vuelta Abajo region, like other Romeo y Julieta cigars. 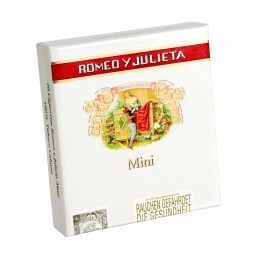 The Romeo y Julieta Mini comes in 5 packs of 20 cigars.